Private Classes are from 10am to 3pm and are tailored to your ability and style. 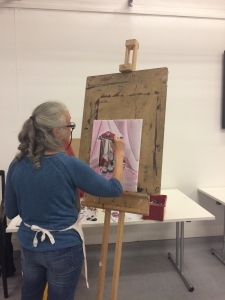 This can range from learning a new technique, gaining confidence with colour or finishing a painting you may be having issues with. If you are a beginner, then this will be a chance for you to learn the basics and leave with a finished painting at the end of the day. Before the class, a telephone discussion is recommended, so Sophie can establish what it is that you would like to gain from the lesson, so you can hit the ground running when you arrive. All materials are provided, as well as refreshments. Classes cost £150 per class, with a discount for multiple bookings.